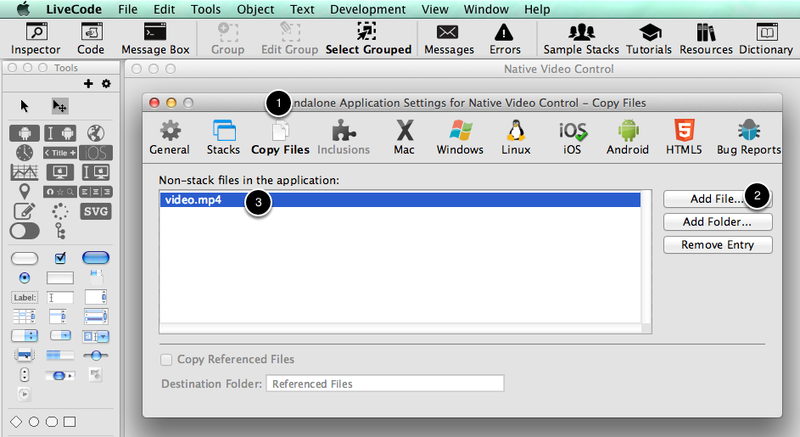 This lesson shows you how to create a native mobile video controller and load a video. 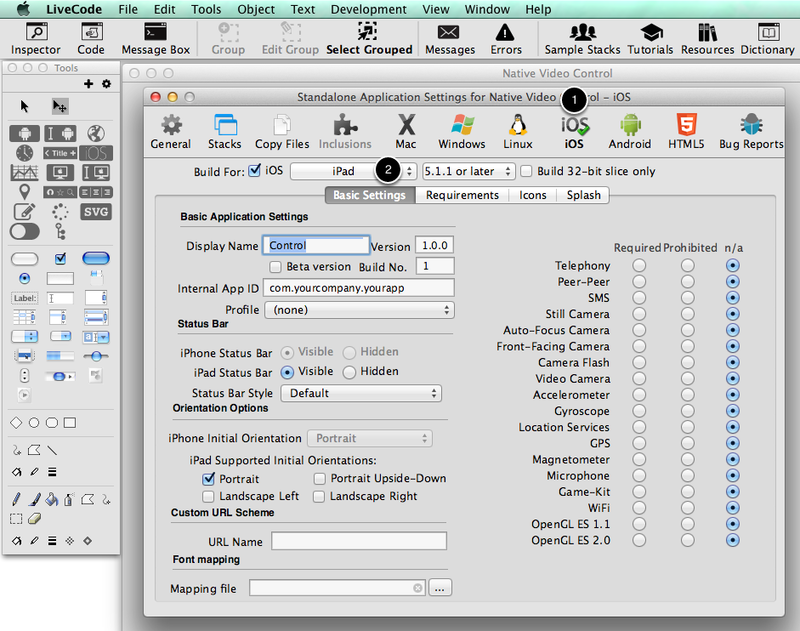 Select File > Standalone application settings. For the purposes of this example we will use the iPad simulator but the tutorial applies equally to iOS and Android devices. We should now have a stack that is setup for simulation with our video file included. We can start coding. Open the card script and paste the following code. The green comments explain what we are doing. mobileControlSet "videoControl", "filename", specialFolderPath("engine") & "/video.mp4"
Click on the Test button to test. As far as I can see, the script is identical to that shown on this page. This causes a script error because iphoneControlCreate is only supported on iOS, not the desktop. The script should run correctly on an iOS simulator or device. so the command is only called when running under iOS. thought I need some help. I want the player to be in full screen upon opening the card. what code should I add? have a look at the dictionary entry for "iphoneControlSet". Under the heading "Player Specific Properties" you will find all the properties that can be set or read. You will want to set the property "fullscreen" to true. Also, could you have an invisible 'play' button above the player that triggers the video, and then either remains active to replay the movie, or then disappear along with the player leaving the background? the answer is yes to both questions, but playback may be impaired, depending on the processing power of the device. You can create a number of players using "iphoneControlCreate". 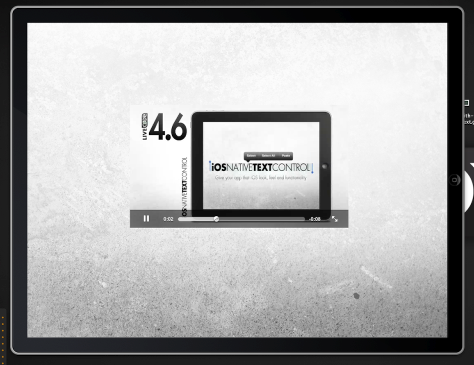 Then control these players with the relevant "iphoneControlSet", "iphoneControlDo" ... commands. You can make a button invisible by either giving it the pattern of the background or you can set it to opaque and remove all of the border types. I know it seems obvious, but as someone who is new to LiveCode and iOS development, I just assumed that the tutorial would be right, so I was looking everywhere in my program to find the problem except for the part I copied verbatim from the tutorial! Anyway, no biggie, but it probably should be updated. yes you are right, the command to delete a control is as you describe. The code in this lesson is implemented in a modular structure with wrapper command calls that can be expanded with additional functionality, if required. There is a command "controlDelete" that wraps "iphoneControlDelete "ioscontrol"". In this short code example it is probably not necessary to use this kind of wrapper functionality, but I would like to keep it. Our discussion may be valuable to other developers. Thanks, Hanson. I can see how that functionality would be useful. Where is the method for setting up such a structure described? I don't see it in this tutorial, but since I'm not familiar with the technique I don't know what I'm looking for. The "on controlDelete" and "end controlDelete" wrap around the code that is to be executed. In this case the body of this command executes "iphoneControlDelete "ioscontrol"". So when you call the command "controlDelete" you are executing the body of "controlDelete". Basically what happens in this example is that calling "controlDelete" invokes "iphoneControlDelete "ioscontrol"". So calling "controlDelete" or "iphoneControlDelete "ioscontrol"" should fundamentally do more or less the same thing. The only requirement is that you have to add a bit more code that tells LiveCode what to do when you call "controlDelete". I am running this code in Livecode 5.5.4 and with Simulator 6.0 which runs other things. It won't run on the simulator. I can see the app but when I click on it simply shows a livecode splash screen briefly and then I see the iPad home with the icon for the app once again. No video. Any ideas on what might be happening here>? there is a bug when playing videos on the simulator under iOS 6.0. This has been addressed in LiveCode 6.0.0. I purchased all the relevant add ons, only to find, that the one feature I need to test is faulty under 5.5.4. When can I get LiveCode 6.0.0 for this to be addressed? if you are sure that the issue has been resolved in 6.0.0, then the gm version is due to be released very soon. If you would like to find out if a particular issue you are having has been reported or is being addressed, then you can access our bug database at quality.runrev.com. The status should indicate to you if a bug fix is available in the latest release of LiveCode. You can also review the release notes that come out with LiveCode, in order to determine if a particular bug has been included in a release. Should this be: if "videoControl" is among the lines of mobileControls() ...? Thanks for bringing that error to our attention. I have updated the lesson. Yes this lesson applies to iOS and Android, I'll update the lesson to reflect this. The only player setting that is not available on Android is "preserveAspect", other than that you should not have to make any other changes to the code. This is working well, except right before the player plays the video, and then again when the player is deleted, there is a black screen flash. Is there anyway to prevent this? I have tested this and can see the same issue, I see you have reported this as a bug so I have attached a sample stack to the bug report. When the Dev Team have investigated they will update the bug report.